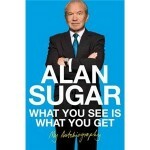 Alan Sugar’s autobiography is quite peculiar in the sense that it’s written as if he is talking to you. You’ll hear his voice as you read the book which makes it more sincere. I was interested in this book mainly because he’s a self-made millionaire from a very poor family in East London. In this book, you’ll learn about his journey in business as he starts from being a salesman to owning a public company, his success as a retailer and manufacturer, his involvement in the football club Tottenham Hotspur, his involvement in The Apprentice and how he got knighted and appointed to House of Lords. Looking at the past, Alan Sugar must be only remembering the good times, since there’s hardly any reference to mistakes he made on the way or things that did not work out. Overall, it’s a lengthy book that is best suited for people working in the retail industry or have special interest in Alan Sugar’s life.